Catcher framing data has created quite a bit of buzz in sabermetric, and even main-stream, baseball circles in the last couple of years. Through the analysis of PITCHf/x data, sharp minds like Mike Fast and Max Marchi managed to put a number on each catcher’s framing ability, which was basically un-quantifiable just a few years ago. Recently, Harry Pavlidis and Dan Brooks took the analysis a step further by incorporating factors such as pitch type, pitcher talent, and umpire tenancies. Using PITCHf/x data to isolate the effects of the catcher is a pretty ingenious method, but as Jeff Sullivan points out in this year’s Hardball Times Annual, it does not account for how a pitcher might change his approach based on the quality of the catcher behind the plate. 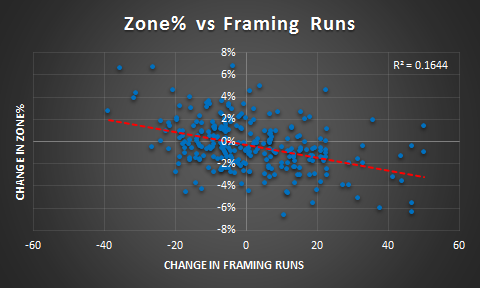 Catcher framing values assume that a pitcher would have thrown the same pitches in the same locations no matter who his catcher was, which isn’t necessarily true. For example, a pitcher — knowing that he’s throwing to a good framer — might throw more pitches out of the strike zone hoping his catcher will turn them into strikes, but ultimately end up throwing more balls instead, potentially doing more harm than good. 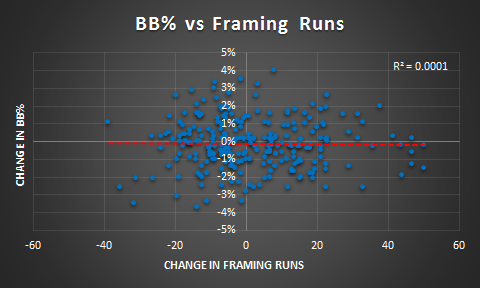 In order to isolate specific effects of catcher framing, I thought it would be interesting to look at how pitchers’ performances and tendencies changed when the quality of pitch-framer behind the plate changed. 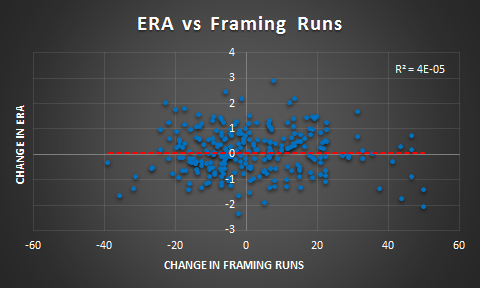 Using the data from Baseball Prospectus’ new framing model, I looked at how a pitcher’s ERA, ERA estimators, K%, BB%, and Zone% changed from one year to the next relative to his teams’ framing performance. Going back to 2008, the earliest year of data availability, I analyzed every instance where a starting pitcher threw at least 150 innings in consecutive years — a sample of 270 data points. 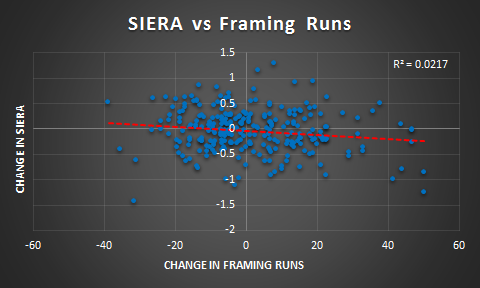 Now we see a pretty clear correlation (in the direction you’d expect) between SIERA and framing runs. 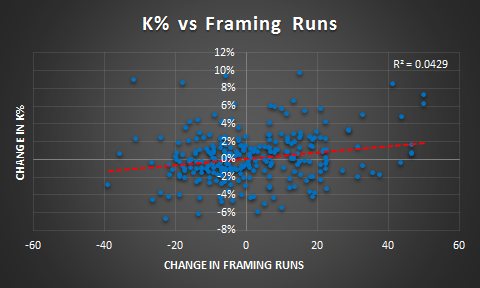 For every 10 framing runs saved (~1 win) results in something like a 0.04 drop in a pitcher’s SIERA. And with a p-value of .0155, we can be pretty sure the relationship isn’t entirely due to blind chance. It’s worth noting, though, that the impact isn’t quite as strong as one would anticipate. Over a full season, 10 runs is worth roughly 0.075 in ERA* — a little more than twice of what we see in the above correlation. *Based on MLB average of 1205 innings per team, per year from 2008-2013. Having a good framer behind the plate is particularly important when it comes to striking batters out — for every 10 runs saved by his catcher, a pitcher’s strikeout rate increases by about 0.35%, or nearly 3 additional strikeouts over a 200 inning season. This may not seem like a huge deal, but consider the 2013 Twins and 2013 Brewers, who had a disparity of 53 runs in the framing department. If Kyle Lohse had played for the Twins instead of the Brewers last year, he theoretically would have had about 14 fewer strikeouts — just because his primary catcher would have been Ryan Doumit instead of Jonathan Lucroy. Having a good framer behind the plate does not appear to have much of an effect on pitchers’ walk rates one way or the other, which is a bit surprising. One would think that a catcher’s ability to disguise balls as strikes would directly lead to fewer walks, but this does not appear to be the case. Could this be due to a change in approach? Maybe pitchers with good-framing catchers throw more pitches outside of the zone, crowding out the effects of framing? That’s what the data seem to suggest. For every 10 runs saved by his catcher, a pitcher throws 0.57% fewer pitches in the zone according to PITCHf/x. This works out to about 17 extra pitches out of the zone over a full season. This is probably the most interesting correlation of them all. It’s pretty clear that pitchers alter their approach based on their battery-mate, even if only slightly. It would seem that this change in approach crowds out any decrease in a pitcher’s walk rate that would be caused by his catcher turning balls into strikes. Catcher framing stats are still in their infancy and we have plenty more to learn, particularly when it comes to how pitchers change their tendencies depending on their catcher. The final graph in this piece proves that pitchers do in fact pitch differently to catchers with varying framing skill. My analysis gets at some interesting findings, but this topic is definitely worth studying in further detail. It might be worth looking into why a pitcher’s ERA estimator drops by just 0.04, rather than the 0.09 that one would expect to see. This discrepancy might be due to pitchers throwing more pitches out of the zone, which could negate some of the value. But other factors could be at play. For example, it could have something to do with good-framing catchers being weaker in other aspects of their defensive game. Just like plenty of slow players get jobs because they can hit for power, catchers who struggle to control the running game might get jobs because they’re good at framing. Good framers might struggle in other areas and ultimately give back some of the bump they provide to their pitcher’s performance. Note: For catchers who played for multiple teams in one season, I split their framing runs based on the number of innings caught for each team. This entry was posted in Analysis, Around the League. Bookmark the permalink.